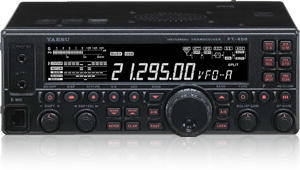 By pressing and holding the following keys while powering on the radio you will gain access to the hidden menu of the Yaesu FT-450. Press and hold ATT/IPO, NB and AGC buttons at the same time and press the power button and power on radio while still holding in these buttons, and to change the setting you simply use the DSP control (rotary) to select the item you want to change and use the main VFO knob to alter the independent settings of your choice. To change the color of your screen, change the settings of LEDINT1, LEDINT2 and LEDINT3, will do most colors. To exit the hidden menu simply press (F) function key. In some radios the radio might also do a full reset. So if you go in there and change anything in there and if you ruin a perfectly good radio, no one is to blame but YOU! Straight cable, Pin for Pin 1-1, 2-2, through to 9-9, or at a minimum if you're making your own: 1-1, 2-2, 3-3, 5-5, 7-7, and 8-8.